There is a juxtaposition of our design history in this photo. In the foreground is the newly opened Ronald McDonald House of New Haven, CT and in the background is the Children’s Hospital at Yale New Haven, opened in 1995. We are proud to have been the interior designer on both projects, earlier with Shepley Bulfinch (formerly SBRA) and later with Svigals and Associates. Caring for families is a legacy at Yale New Haven. Both buildings embody a culture of family-centered care. 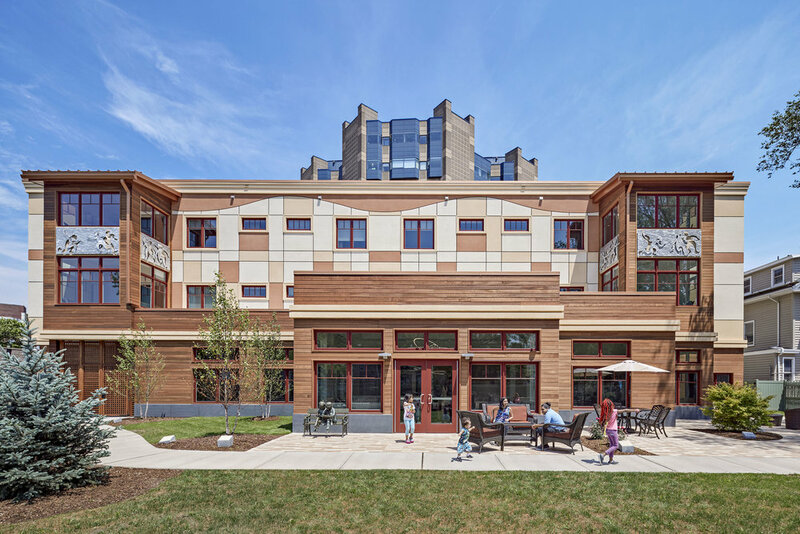 The blue bay windows in the Children’s Hospital represent a conviction we shared with the late Lloyd Acton, former Principal at Shepley Bulfinch, to institute rooming-in for families. We had no choice but to design a built-in a custom sofa sleeper as Lloyd added bay widows to the plan to accommodate this then rare feature. Some 22 years later, CAMA co-created the IOA Cama Chaise Sleeper (IOA Healing Touch Collection) which enables families to spend time in comfort with their hospitalized loved ones. Learn more about the Chaise Sleeper here.